He Jiuying 何九盈 (1995). Zhongguo xiandai yuyanxue shi (中囯现代语言学史 "A history of modern Chinese linguistics"). Guangzhou: Guangdong jiaoyu chubanshe. Wu Rui 吳銳 (1996). 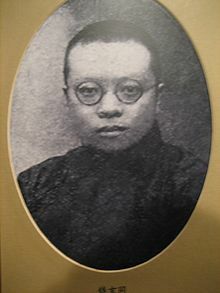 Qian Xuantong pingzhuan (钱玄同评传 "A Biography of Qian Xuantong"). Nanchang: Baihuazhou wenyi chubanshe.